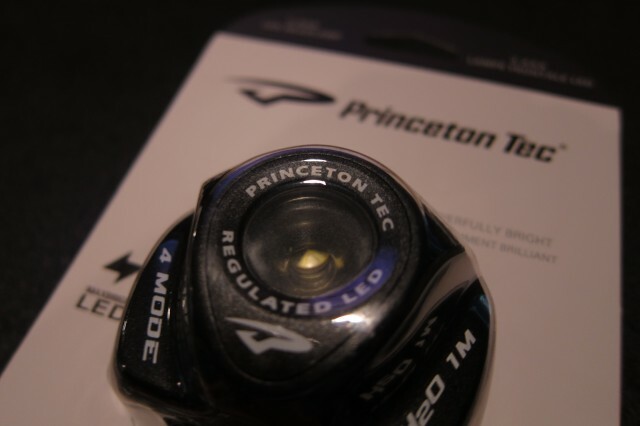 The Eos falls under the “professional” branch of Princeton Tec’s products. Members of the “professional series” are waterproof to IEC Level 2 (down to 1m). This means they all have a rubber o-ring, something none of the “the family” members such as the Remix have. Additionally, members of the “professional series” feature regulated output. Unregulated lamps will be very bright when new batteries are installed, and they get dimmer as the batteries drain. Regulated lamps will hold a constant brightness until the energy left in the batteries can not sustain that brightness, then they dim until the circuitry cuts out. Typically, this is done using a switching regulator, and is something that my old Matrix had, and was something I wasn’t going to give up. Speaking of battery life, I’ve ran with the Eos twice a week since the second week in November. 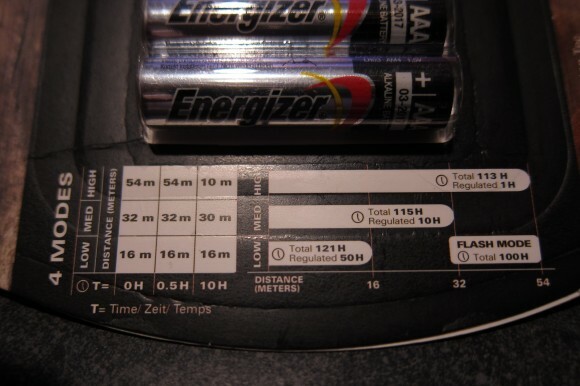 Using the medium brightness setting, the included AAA batteries lasted through January. By lasted, I mean they powered the lamp so that the emitted light was useful on the sidewalk. The runs were anywhere from 45 minutes to 90 minutes, with the headlamp on the entire time. This equates to about 24 hours before being too dim. Note that I have been running on a mix of sidewalks and trails with occasional street lights and headlights from traffic. There hasn’t been much snow, and we’ve had quite a bit of ice on the asphalt sidewalks. Both of these combined require more light to safely see what is going on. Trail running, away from street lights and traffic, with some snow cover, would only require the lowest brightness mode, which according to Princeton Tec, lasts 50 hours. As with my previous two headlamps, Princeton Tec provides as set of Energizer batteries for the headlamp. While they both used AA batteries, the Eos uses 3 AAA batteries. 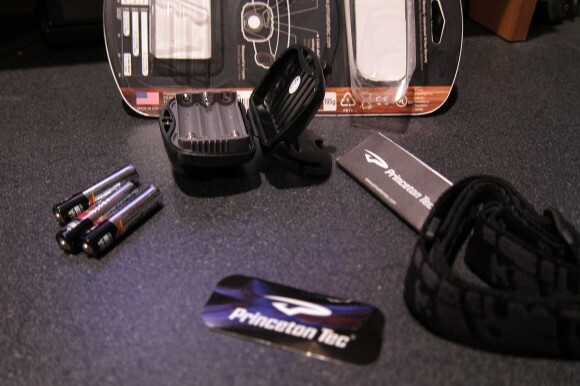 Other than the batteries, the package includes the headlamp body, a head strap, usage instructions/warranty information, and a Princeton Tec sticker. No felt carrying/storage bag included, unlike my previous two lamps. While overall I love this headlamp, the one thing that does bother me is the strap. It is a simple headband, without a over the head portion (the Apex has this, as did my previous two headlamps). This is not a problem most of the time, however I think it would provide more stability for the lamp while running. Since this winter has been quite warm, I have warn this over a hat, and without a hat. The slight difference in circumference is enough to require readjusting the band. Too tight and you get a headache, too loose and the light bounces up and down with your stride. Quite annoying if you ask me. Though, this is something you will see with all headlamps with a similar headband except for those that are much lighter. Nice review! I wonder how hard it would be to find/make an “over the head” add-on strap? My old Matrix’s head strap could be a donor. Though, if I remember correctly, the way the Matrix connects to its strap is a bit different from how the Eos does it.